In our busy world, the simple, everyday act of preparing and eating meals can go overlooked and uncelebrated. 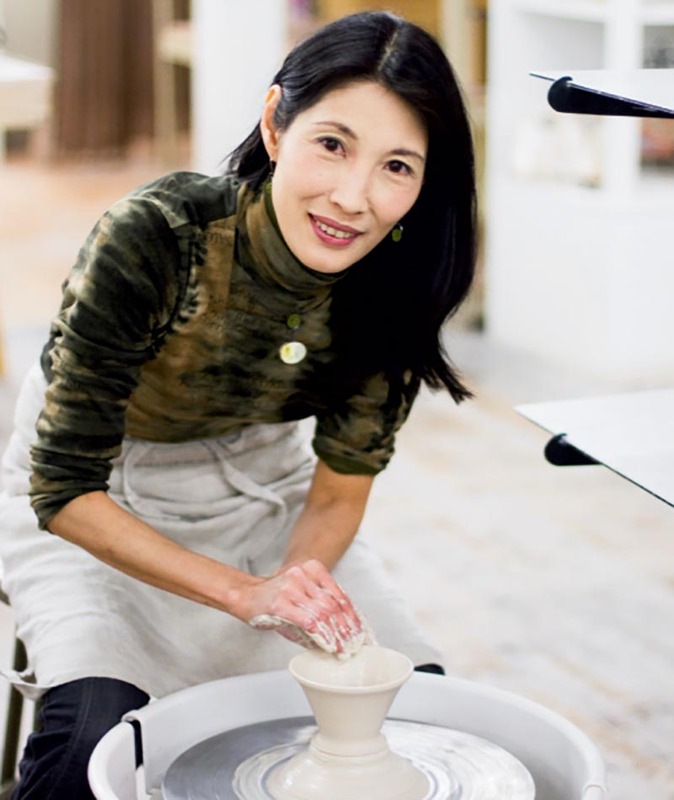 Ceramist Reiko Miyagi tries to elevate the experience with hand-thrown plates, mugs, teapots, and other tableware and decorative ceramics that infuse beauty and harmony into daily life. From her Weaverville home and studio in Asheville’s River Arts District, she brings a sensibility of “good spirit,” as she calls it, from her native Japan to her work. Miyagi studied art at Tama Art University in Tokyo and then honed her craft in the potters’ town of Mashiko. While it’s not the only potters’ community in Japan, it’s distinctive because there’s no one dominant tradition or signature style, and experimentation is encouraged. Miyagi says it’s a place where she found a supportive community of potters and a wealth of inspiration. She moved to San Francisco in 1998, where she once again encountered new influences and discovered sgraffito, a technique developed centuries ago in Italy. The process begins with a bare clay body. Using a brush dipped in black underglaze, Miyagi paints images from nature—spiraling fern fronds, wind-blown grasses, animal horns, and the limbs of trees. Once dry, she carves back into the black to add details and sharpen the illustration. The deep, crisp lines against the warm white background create a striking contrast. She finishes the look with a clear glaze. “The spiral has power for me as a symbol of the vitality of life as well as the infinite and unknowable,” Miyagi says. Her imagery is influenced by the Japanese concept of yaoyorozu no kami, which loosely translates to “myriad” or “many gods.” More than an aesthetic principal, it’s a Shinto belief that there is a divine spirit in everything in nature. It focuses on the sacredness of nature and the interconnectedness of all living things. “Although I could never make something with the perfect beauty one finds in nature,” she says, “my art expresses my appreciation of this beauty.” In addition to ceramics, Miyagi makes metal, enamel jewelry, and encaustic multimedia pieces that also reflect her interest in layered materials and simple imagery. She’s found a fitting haven in the Asheville area. Coming to WNC’s mountains after decades in San Francisco felt like coming home, Miyagi says. She understandably named her studio Tabula Rasa, the Latin expression for “clean slate.” Here, along with her husband and two children, she lives a life that’s close to those spirits of nature that inspire her.